The Fourth Industrial Revolution’s Impact on Smaller Militaries: Boon or Bane? 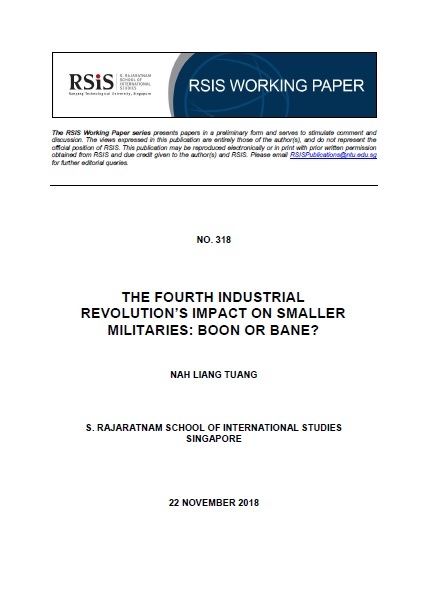 WP318 | The Fourth Industrial Revolution’s Impact on Smaller Militaries: Boon or Bane? Even as smaller and less well funded armed forces are still grappling with incorporating computerisation into personnel, supply and other military functions for increased efficiency or effectiveness, this hallmark of the Third Industrial Revolution is already being eclipsed by developments from the dawn of the Fourth Industrial Revolution. Developments like artificial intelligence, autonomous drones, three-dimensional printing and genetic engineering will deeply affect the profession of arms, with armed services from smaller or poorer nations being no exception. Without the deep pockets needed to fully exploit all these cutting-edge developments, small and mid-sized militaries will still have to adapt as best as they can to the changing winds of the Fourth Industrial Revolution while attempting to mitigate any harmful after effects. The industrial and technological impacts of this revolution on the human resource, intelligence, logistics and operational functions of smaller armed forces will be examined and their implications analysed. Accordingly, the overall military influence of the Fourth Industrial Revolution can be assessed and appropriate operational and policy-based advice for smaller armed services suggested.